Back in the days of Abraham Lincoln, the atom was a strange-looking thing indeed — a bunch of smoke rings. At the turn of the century the atom took on another shape. “It looks like Saturn, the planet,” said Japanese physicist Hantaro Nagaoka. If these pictures of the atom seem odd to you, bear in mind that no one has ever seen an atom. Because of this, scientists throughout history have built many atomic models in their attempts to get a better understanding of the nature of matter. 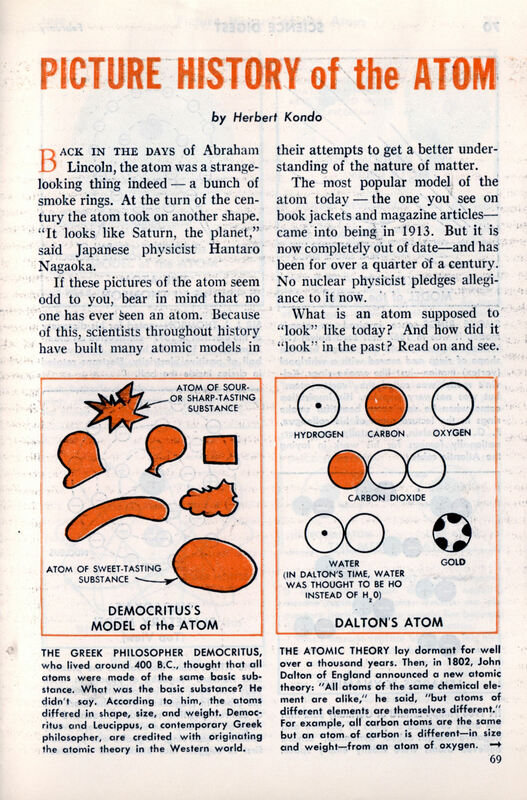 The most popular model of the atom today — the one you see on book jackets and magazine articles— came into being in 1913. 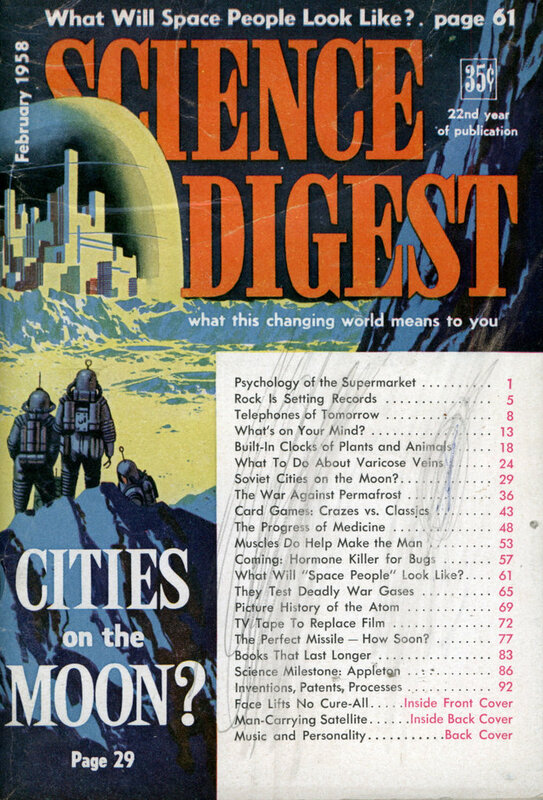 But it is now completely out of date—and has been for over a quarter of a century. No nuclear physicist pledges allegiance to it now. THE GREEK PHILOSOPHER DEMOCRITUS, who lived around 400 B.C., thought that all atoms were made of the same basic substance. What was the basic substance? He didn’t say. According to him, the atoms differed in shape, size, and weight. Democritus and Leucippus, a contemporary Greek philosopher, are credited with originating the atomic theory in the Western world. For example, all carbon atoms are the same but an atom, of carbon is different—in size and weight—from an atom of oxygen. SMOKE RINGS once inspired an atomic model. It was in 1867 that Lord Kelvin (Sir William Thomson) said that atoms had the shape of rings and moved with a whirlpool (vortex) motion—just like smoke rings. Kelvin’s model was called the “vortex atom” but was not very popular. His inspiration came when he saw some beautiful smoke rings in the lecture room of his colleague, P. G. Tait. Kelvin, incidentally, was internationally famous for his work in laying the Atlantic cable. IN 1903 Philipp Lenard of Germany said that the atom consisted of pairs of positive and negative charges called “dynamids.” Lenard believed atoms were mostly empty space. SIR J. J. THOMSON-noted for his discovery of the electron in 1897—constructed an atomic model in 1904. To him the atom was a ball of positive electricity. Electrons rotated in circles inside the ball. “THE ATOM looks like Saturn, the planet,” said Hantaro Nagaoka of Japan, in 1904. Thus was born the first planetary model of the atom. In Nagaoka’s mind the atom had a central positive nucleus surrounded by rings of electrons. The electrons were evenly spaced in each ring. Nagaoka was probably first to suggest that atoms had a nucleus. THE YEAR 1911 was the year of decision for atomic models. In that year Lord Ernest Rutherford showed experimentally that Thomson’s model of the atom was wrong. Rutherford changed Nagaoka’s model so that the atom had a central nucleus surrounded by a sphere of electric charge opposite to that contained on the nucleus. At first Rutherford didn’t say whether the nucleus’ charge was positive or negative; later he stated that the charge was positive. THE MOST POPULAR concept of the atom today was originated by Niels Bohr in 1913. Bohr gave the electron definite orbits to move in. He believed that light .would be given off by an atom whenever electrons jumped from outer orbits to inner ones. A VIOLENT REVOLUTION shook the world of atomic physics in the mid-1920’s, and nearly alt cherished atomic models were overthrown. New theories arose in which the atom lost its definite shape. “We can’t say precisely where an electron’s orbit is, anymore,” scientists say today. “Electrons may be anywhere within a certain region outside the nucleus.” An atom of hydrogen, which has only one electron, is today pictured as a cloudy blur. After the neutron was discovered in 1932, Werner Heisenberg of Germany suggested that the nucleus contains only basic particles, such as neutrons and protons. Today the atom is believed to contain still other basic particles, such as mesons. Mesons are popularly believed to provide the force that holds the nucleus together. THE LATEST DEVELOPMENT in atomic models is an artificial atom in which negative mesons replace electrons. Mesons are elementary particles whose weight lies between those of the proton and the electron. When mesons replace electrons, the mesons revolve in similar but smaller orbits. For very heavy elements, such as lead, the innermost orbit lies inside the nucleus. The mesonic atom has been created by scientists at Columbia University and already it has led to important results in nuclear physics. Experiments with the model indicate the nucleus of an atom is only half as large as it had been thought to be.